Have you ever heard of surfing Bingin Beach? probably not! it is not one of those super known spots, nevertheless its also not a top secret spot. What i can say is that the beach has been spared by mass tourism and that's cool. There is no huge mega hotel with hundreds of rooms. I'll be honest here, the beach perhaps not the most beautiful one to sunbath and the rocky environment makes it tricky to go for a relaxed swim without hurting your feet. So let's talk about surfing Bingin Beach! How to get to Bingin Beach? I already made a detailed Blogpost about the Bingin Beach itself so i'll quote this section here and you can read more information about where to stay and how to get there on this post. "Bingin Beach is situated in the southern part of Bali, the region of Uluwatu. Bali has its own airport in Denpansar which is 35 min car drive away from Bingin Beach. Book a hotel close to the beach or park your scooter at the beach parking. Just google for “bingin beach parking”. From the parking should be street signs leading to the beach. The way leads through unconventional narrow streets through the buildings in front of the beach. sometimes the way seems to be wrong but trust the signs your on the right track." The drop: the surfer is on top of a clean faced wave building up on the Bingin Beach reef. Surfing Bingin Beach means dealing with sharp rocks. It is a reef break and i can highly recommend you to wear water shoes. I cut my feet, not very dramatic but you can hurt yourself seriously if you're not carefully, especially on low tide. I even saw some people surfing with helmets. Always stay safe buddy. After a successful drop the surfer maneuvers himself slightly into that beautiful tube. Is there a Surf school? Yes, there are one or two surf schools. 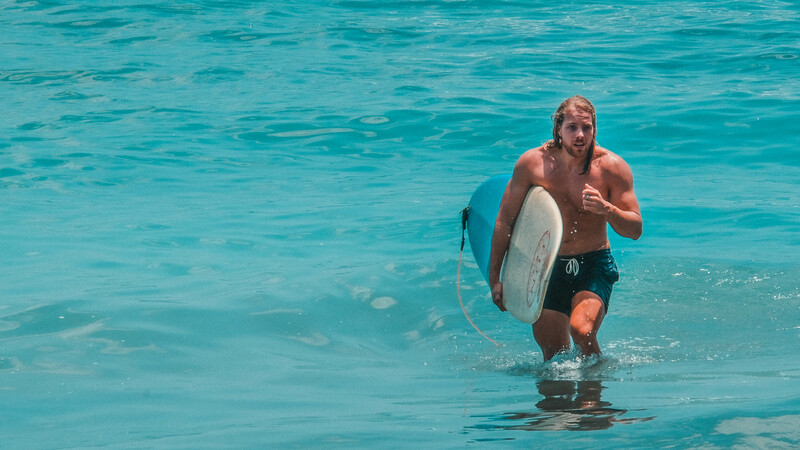 I've never participated in a lesson nor have i analysed their teaching style, but what i can remember is that some locals paddle out with you and teach you how they surf. So don't expect a "WSL" internationally certificated pro surf school. Ending the ride with splashing up a some sea water. great job! Can i rent a board in Bingin Beach? Of course you can! The surf schools offer boards for beginners but you will also get some smaller specimens if you are a more advanced surfer. I think there is even a shaper, because they offer board repairs right by the beach. I mean in case you f* up your board shredding too hard. haha. Bali is one of the Islands in the southern part of Indonesia. Mostly there is tropical warm weather on the Island. The Island has an airport in the capital city of Denpasar which is situated in the South of Bali. The most beautiful month on Bali is September and the Rainy Season lasts from the end of november until the end of march. Most people speak balinese or indonesian on the island. We travelled Bali for a month. We landed in Denpasar in the south of Bali and went up to the north. We stayed in places like Nusa Dua, Canggu, Ubud and Pemuteran. A full week on Gili Trawangan in Indonesia means really a full week of relaxing and slowing down. Already the fact, that on the island no engines are aloud and only bicycles, horses and your own feet bring you from A to B, proves that you will really slow down. But that's not the only thing. 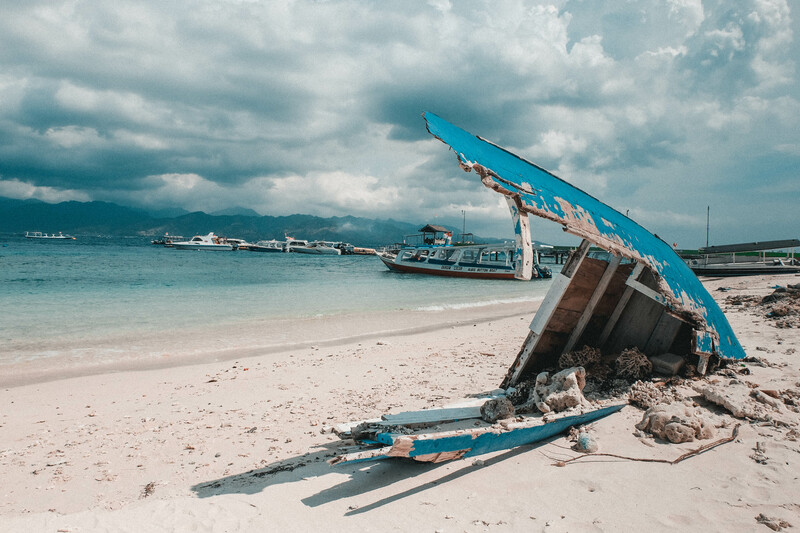 Gili Trawangan is the most populated of the three Gili Islands, that means you will find lots of nice restaurants and bars there. Gili Trawangan has a lot of nightlife to offer as well. Boats bring you to the more deserted neighbor islands Gili Meno and Gili Air. Lots of beautiful reefs for snorkeling and diving around. How to get to Gili Trawangan? 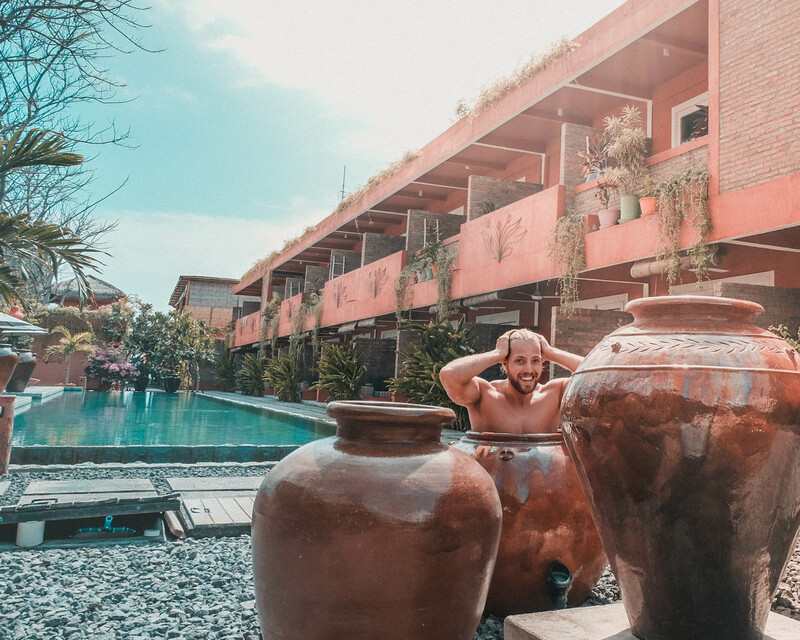 Of course in the Pinkcoco Hotel, it is not right in the center of Gili Trawangan but they have a restaurant, a popular bar and bicycles for rent. The beach is sandy and in the water a bit rocky but depending on the tide there are some good areas to go on a swim. And of course there is a hotel pool if you prefer to avoid the salt. Amazing restaurants on the island. Places to have a meal, stare at the ocean and live life to the fullest. Which are the best Restaurants on the Island? The nightlife is vibrant on the island. live music and raving party all night long. Do not miss the tropical fruit juices! I'll be honest, i already saw a couple of water swing pictures swinging through instagram before i saw this Gili water swing on the Gili Trawangan Island. Nevertheless it is something fascinating, a swing placed in the middle of the ocean. This one was placed right in front of the hotel we were staying. Someone had the idea of building such a water swing and now there are a handful of swings on the island or in the sea, however you want to call it. During the daytime the swing is often occupied by people shooting pictures and making selfies. The first time i had the chance to get on it, i tried to swing. first attempt failed. One of the two swings was hanging a bit lower than the other one. with the lower one i had no chance to swing because it was too hard to get enough velocity to swing out of the water. It depends on the tide, when it's high, it gets more difficult, when low, easier. The second try on the other swing was successful. i gained height once the swing came out of the water. Trust me, that was fun! How to get to the Gili Water Swing? As i mentioned there are couple of water swings on Gili Trawangan. I think there are already some in Bali as well. Just do your research. Get on the island, stroll along the beach. You can actually get around the island easy in one day. If you see a water swing out in the water and nobody is having a shooting on it. Go swing the shh out of you. this stage is called "the posing", while shooting pictures or thinking about a strategy. This is the moment moving out of the water, use this momentum. 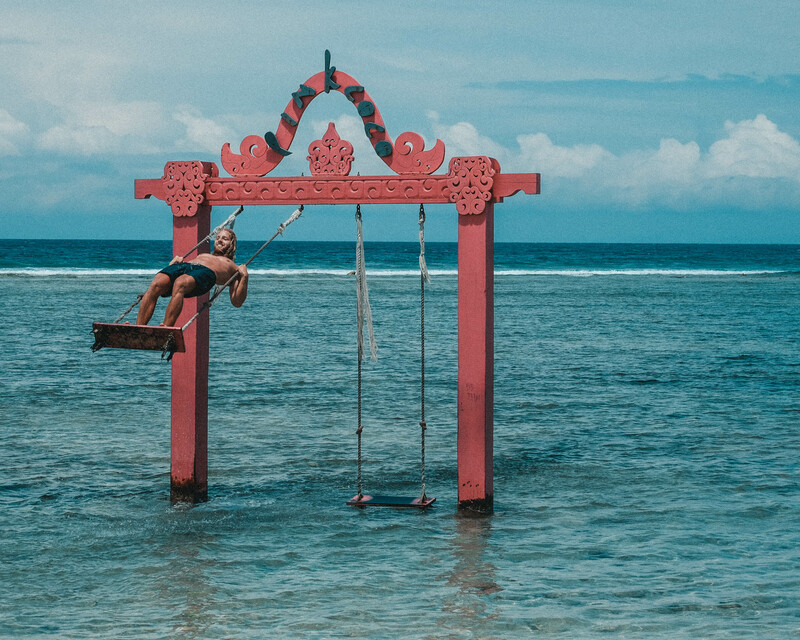 What is special about the Gili Water Swing? Instead of lying the whole day on your beach chair and burn your skin while reading a bad book, move your body an feel like a child again. You will experience that it takes a bit more energy to swing while the water is breaking your speed. But once you get that velocity and height, the water splashes up when touch down, that's an amazing feeling. Getting sweaty? no problem, just drop in the ocean and feel like newborn. it is amazing trust me. This stage is called "sky high". feel the realease of dopamine. How to get to the PinkCoco Hotel? First of all you need to get to Gili Trawangan which is an Island. This is one of three islands located between Bali and Lombok, Indonesia. On the Islands are no motors allowed so either you get on a coach, walk or you get around with a bicycle. And it can be pretty difficult to ride to the hotel with bags on a bike. So the only options are to walk or get on a coach. It's about 22 minutes to walk from the port to the Pinkcoco Hotel. First we decided to get on a coach but the prices were really high, 100 Indonesian rupiah as i remember. It is affordable compared to other tourist destinations but compared to Indonesia the price is pretty high. So we decided to walk. After the first steps with the luggage, the bad roads, the burning sun on our neck, we decided to pay the price nevertheless. After trying to negotiate the price we hopped on the coach. A coach on a rainy day transporting tourists. What is special about the Pinkcoco Hotel? Of course it is all pink, the building, the interior, the restaurant, slippers and the towels as well. That somehow a special experience to live couple of days in a pink world. The Pinkcoco hotel has its own bar which is crowded in the evenings. people come to enjoy the sunset because it sets right in front of the bar with a fantastic view on the sea. This is me, having fun on the famous waterswing. After arriving with the taxi in Padangbai we've been approached by a lot of street sellers to buy a Gili boat ticket. We've already purchased one online with a dubious boat company which i'm not gonna mention here because we were not happy with the service. there was no pickup point described nor a proper pick up time or meeting point. so we had to ask our way through the hotel reception and some small offices of this company. The staff was not friendly but we managed to get to the port in time. I have never experienced such a messy boarding. The boat was delayed and we waited for more than two hours to depart. The port is pretty chaotic, people screaming around departing times from different companies, vendors are selling beverages and the waiting room is packed full with tourists. How to get to the Gilis? Like i mentioned we purchased our Gili Boat ticket online. Actually there are a lot of different options to get over to the islands. In peak season i can recommend you to buy a couple of days in advance, otherwise you could miss your preferred departing day and time. But whilst low season you can actually book a day before departing or even on the same day you want to leave. If you decide to buy from a street seller always negotiate the price and compare different offers. You can choose between private boats, which are the most expansive, fast boats and public ferries. We chose the public ferry because it is the cheapest option and we actually enjoy a good boat trip. We stayed at a hotel close to the Port of Pdangbai. What we didn't kow then, we had to walk all the way with our luggage to the Gili Boat ticket office and from there they brought us to the port again. What is special on the Gili boat trip? 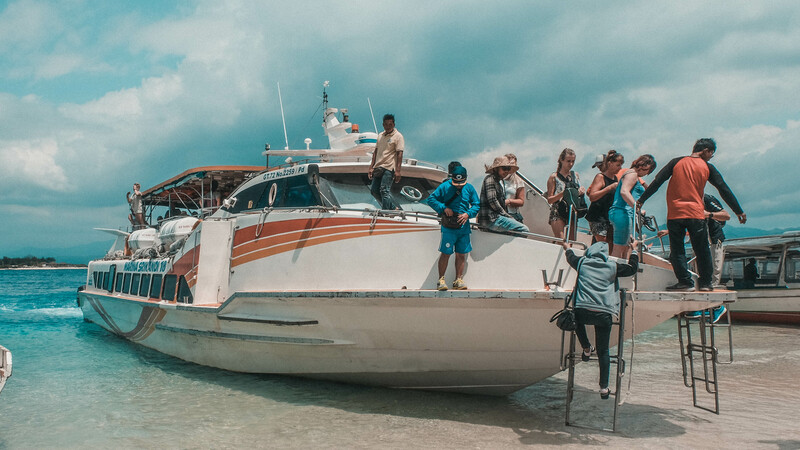 Me personally love boat trips so i really enjoyed the whole journey from departing in bali until arriving to the Gilis. You see the Islands from the water perspective and that's cool somehow. 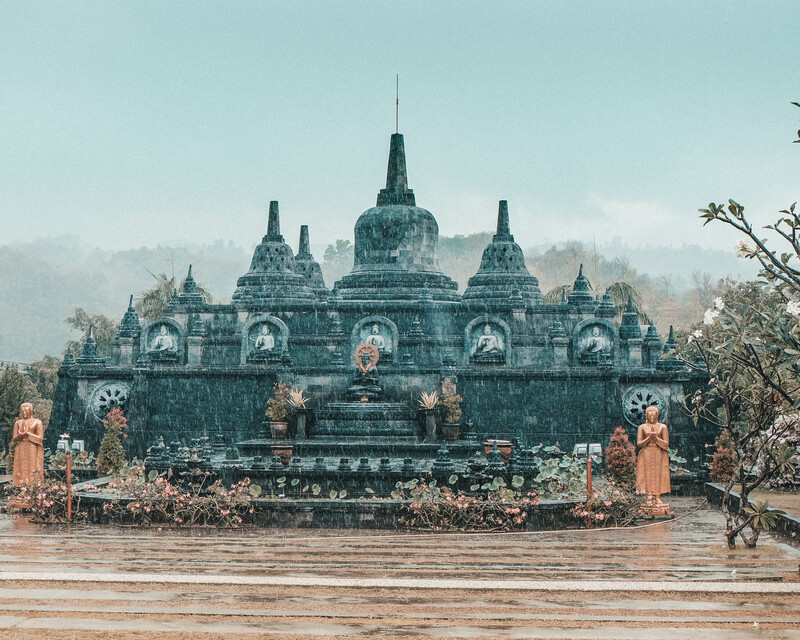 We explored the Brahmavihara-Arama Temple in the north of Bali. This temple is also known under the name of Vihara Buddha Banjar. We where the only tourists exploring it at the time we arrived. The North is not as popular as the south but it has so many gems to offer. The Brahmavihara-Arama is a buddhist temple and is still in use as a meditation center. How to get to the Brahmavihara-Arama Temple? The Temple is situated in the North of Bali, Indonesia. It is built on a hill, overlooking the city of Banjar. The temple is actually not that easy to find so make sure to visit it with a guide or a driver who really knows how to get there. You can try it by yourself but driving with gps is recommended because there are no roadsigns showing the way up the hill to the temple. We stayed at a hotel close to the center of Ubud and not right in the jungle. There are tons of options. From Ubud we went on a tour to the temple. Like i wrote before, this is not a very popular tourist spot. At the time we visited the temple there were only one or two other tourists visiting. The Buddhist buildings are very unique and the meditation rooms built in a simple and minimalistic design. 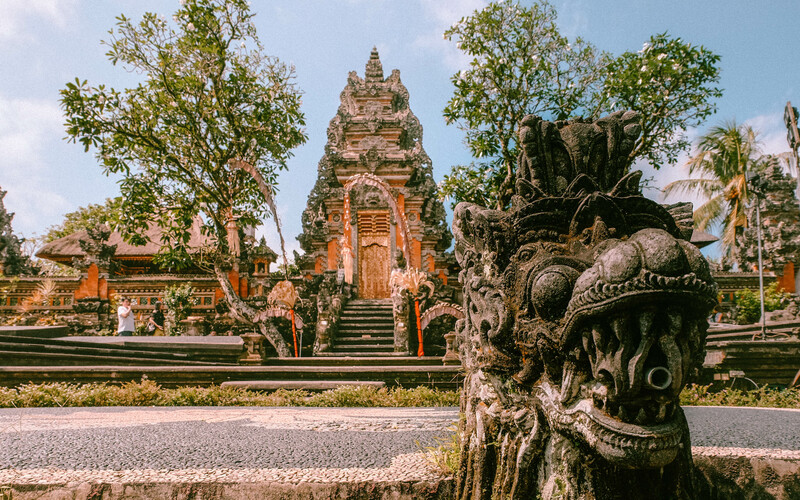 The architecture is a bit Hinduism influenced because of the main religion in Bali. This place is really recommended if you are interested to learn more about Buddhism. The door to the jungle in a meditation room. 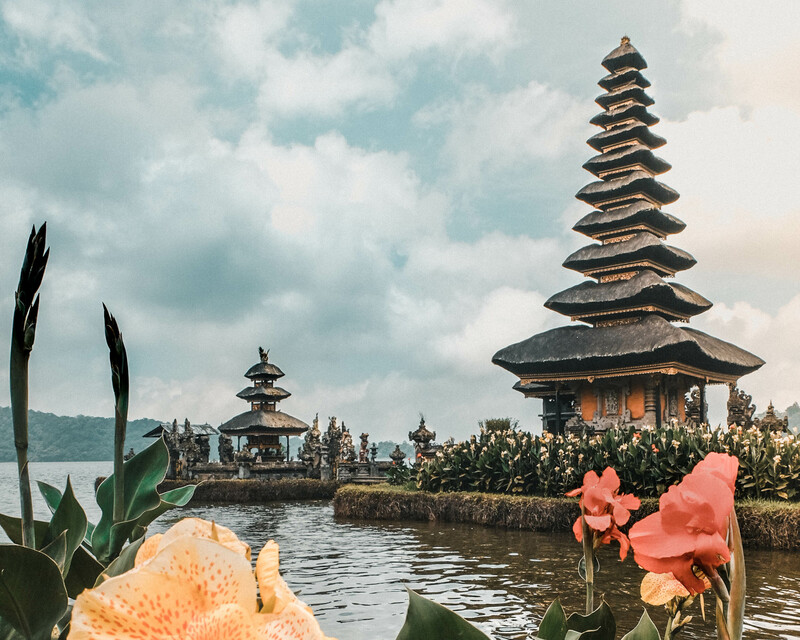 The Pura Ulun Danu Bratan is a Hindu watertemple in the heart of Bali, Indonesia. "Pura" means temple in indonesian. So in english: "Ulun Danu Bratan Temple". The temple is well known for its unique traditional architecture. the temple is built on a vulcan lake and the water of the lake is declared as holy. How to get to the Ulun Danu Bratan Temple? The Temple is situated in the Center of Bali, Indonesia. It is built on the Bratan lake. It is 1200 m .a.s.l in the mountains of Bali. Rent a scooter, join a tour or get there with a taxi. there are plenty of parking lots next by the temple area. The temple has its unique traditional architecture. The thin stacked roofs reach out to the sky out of the Bratan lake. The shore around the temple is stocked with beautiful flowers. There are statues of dragons which protect the temple. You can go on a boat trip around the temple for another perspective from the lake. The park next to the Pura Ulun Danu Beratan temple is also worth to stroll through. Trees, flowers and Statues. This spot is really worth a visit. Posing with the statues in the Park. we explored the famous Tegalalang rice terrace. back in the days it was simply used to farm rice. Nowadays it is mainly a tourist spot. but why? because the layers of the rice fields are very aestethic! The terrace are close to Ubud in Bali, Indonesia. How to get to the Tegalalang Rice Terrace? 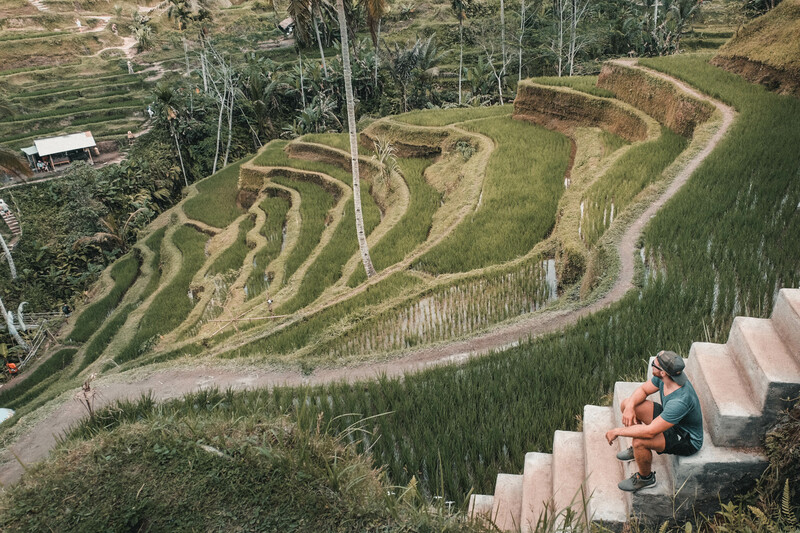 In Ubud you will find a lot of Tourism offices which offer a guided tour to the Tegalalang Rice Terrace. I can recommend to compare prices and the details of the tours. We stayed at a hotel close to the center of Ubud and not right in the jungle. There are tons of options. Those Rice terraces are in real ways to plant rice in Bali. there are several other rice terraces. The Tegalalang is simply one of te most famous ones. The layers of rice plantation makes this places so special and aesthetic. So it attracts thousands of tourists every month. between the rice plants is water and sometimes you can even see fishes swimming aroud in there. Exploring this amazing plantation site. The Gitgit waterfall is the biggest waterfall in Bali. It is actually not just one waterfall. it is a river droping in several sections and forming a handful of different waterfalls. These are all called the Gitgit waterfall. The Gitgit waterfall is situated in the north of Bali. Bali has its own airport in Denpansar which is 2 hours and 15 min car drive away from and to the falls. The Gitgit waterfall is 2 hours car drive away from ubud. Rent a scooter, book a driver or take a taxi or an uber to get there. Arrived at the parking you'll walk a couple of minutes to the first waterfall of them. What is special about the falls? 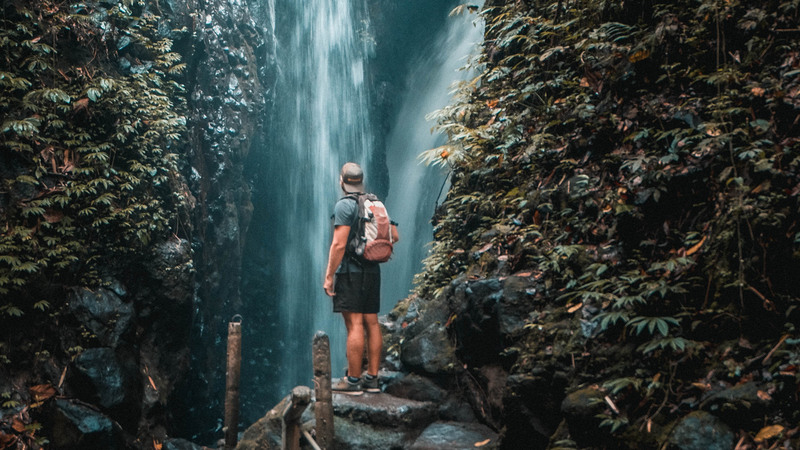 The taxi driver will recommend you to explore the Gitgit waterfall with a guide but actually it is easy to find the different waterfalls by yourself. From the parking spot you'll walk yor way straight to the first fall and then just follow the river for the other ones. One of the falls is the biggest in Bali but i actually enjoyed the "twin waterfall" the most because of its aestethics and its unique look. This is me standing in front of one of the gitgit waterfalls. You will have to pay your transport, a tour, a driver, taxi or scooter and when you arrive there is a fee to enter the falls. but its just a couple of bucks. Ubud is a city in Bali known for it's spiritualism. We enjoyed yoga, explored temples and we've eaten amazing food. In the past years Ubud became very popular for tourists. And with the tourists there comes infrastructure. There is a huge market in Ubud, a lot of different hotels and restaurants, cafes and bars. How to get to Ubud? Ubud is situated in the center of Bali, more or less in the middle of the Jungle. Bali has its own airport in Denpansar which is 1 hour and 20 min car drive away from and to Ubud. Most of the Hotels offer a transport (with extra cost mostly). Feel free to take a taxi from the airport, Buelbird taxis are recommended, you'll catch one outside of the airport, not right at the gate, compare prices, some try to scam you. Grab, Gojek or Uber offer great prices for transportation, keep in mind those are mostly not certified drivers. Small religious statues on the wall. This is my exploring the Ubud market. A super delicious Dragon Fruit Smoothie.